You may have noticed your life move into low gear in March, thanks to Mercury retrograde. Now, though, you’ll feel ready to tackle projects with your usual intensity. Mercury is moving forward once again, and with the Sun in “come on!” Aries at the start of April, you may feel tempted to rev up right away. A little more waiting will serve you well, though! From April 1 through 5, the Moon will be at the close of her monthly cycle as she moves through the balsamic Moon phase. That’s the quietest, most dreamy and mysterious of all the Moon’s many phases – and the best for meditation and introspection. The new Moon of April 5 will be here soon and bring great energy for new beginnings. So be strategic about new starts. With the Sun moving through Aries in your house of work, health, and pets, get ready to make progress and flex your leadership muscles (and your penchant for fun with four legged pals). Target April 5 to get going on anything related to your job, from hiring new employees to starting projects to getting the ear of important people who can further your career. You also can use this Aries time to make a new start on anything involving wellness, so try a new workout or gym, find a better health practitioner or specialist, or explore holistic modalities. This period also supports anything related to your beloved pets. If you want a new furry or feathered companion, visit a shelter and take steps to adopt. If you already have a pet, get current on medical care at your vet’s office and adjust food as needed. Mostly, though, just have fun playing with your pets so you’ll both be more physically active. On April 20, the Sun leaves Aries for love and peace seeking Taurus. It’s time for you to explore life’s sensual pleasures with your spouse or significant other. If you’re dating seriously, consider getting engaged, as this time favors making it permanent. Whatever you do, bring nature’s beauty and serenity into the picture, perhaps with outings together to a park or secluded picnic spot or by popping the question at an outdoor cafe or other venue. Taurus time also supports your success in partnering with an agent, advisor, or other professional ally. Consider a joint venture with a colleague if it’s right for your business. Use clues from that period to guide you this time. You may learn important news related to a confidential project or secret invention you’re developing. This part of your chart also relates to dreams and intuition as well as health, so you may have a breakthrough in one of these areas. Pay attention to any information revealed during this time. 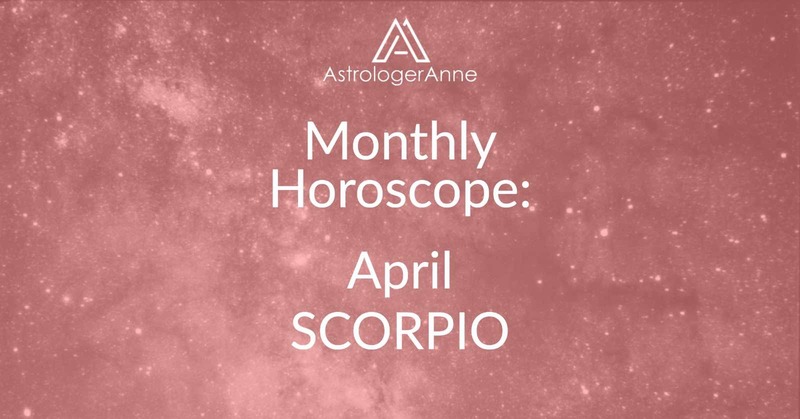 Have a happy April, Scorpio! I wish you a wonderful month!